Learn how much money your business can save. 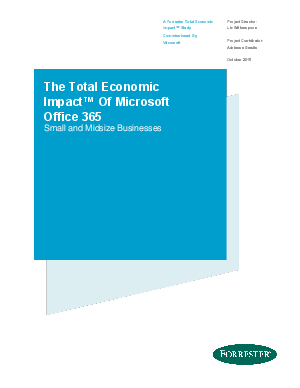 In an objective study commissioned by Microsoft, Forrester Consulting investigated the Total Economic Impact™ for small to medium sized businesses, with 1 to 250 employees, using Office 365. The study revealed a sizeable return on investment. Improved Business Continuity. How enhanced business continuity lead to an avoidance in lost billable hours of $15,000 annually. Increased mobile worker productivity. How an investment in mobility saved 45 hours per year per worker. Lowered Security, Risk, and Compliance Costs. How an organization went from 15 data breaches per year to 1, resulting in $1,400 in annual savings.